“We've got a visitor at the back of boat,” Skipper Rod calmly informs us as we're settling in for a cool drink after a full day's fishing the estuaries and tidal creeks around Doubtful Bay in the Kimberley. “She's just popped by to say hello,” he says. 'She' is a 4+ metre Tiger Shark mixing with the gaggle of cheeky little reef sharks that have come to investigate Kimberley Pearl anchored in the middle of the bay. We christen her 'Betty' and call out her as she glides serenely past the transom, occasionally taking a peak above the surface to exchange glances. Fishing guide, Chris, is busily filleting our Esky full of Mangrove Jack, Fingermark Snapper, Javelinfish, cod as well as a couple of prize Barramundi won after hours of sweat and toil (and a few choice exclamations) amid the tangles of mangrove roots and oyster-encrusted boulders that typify these ancient waterways. Bite size scraps find their way into the water and the big predators posture and jostle for dining rights. The heads and big leftovers go aside for tomorrow's mud crab bait. 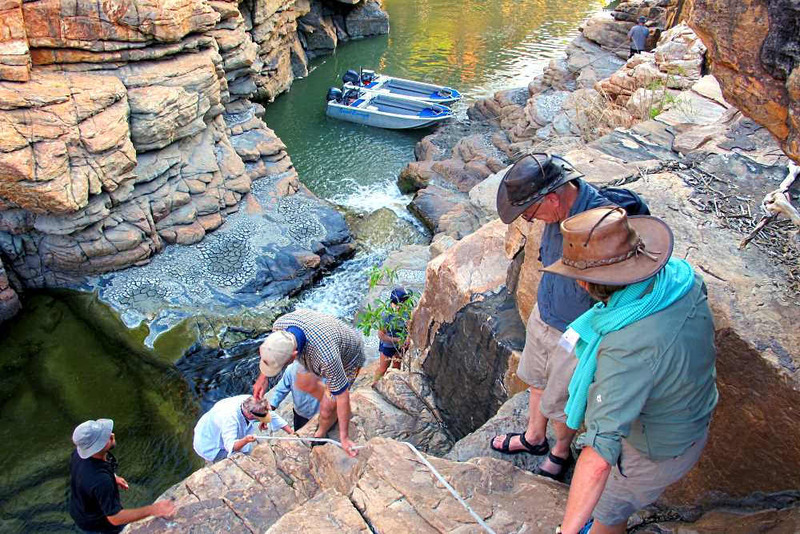 The coastal waters along the rugged Kimberley coastline are alive with fish of dozens upon dozens of varieties, a sure sign of a flourishing ecosystem that supports more than its fair share of predators from the greedy river fish, right up to the apex species of sharks and the stealthy four-legged reptiles on permanent sentry, always within an easy stone's throw. As we sit in the dinghies, our hooks baited with tiny mullet and mesmerised by the sun and the gentle slap of water against the metallic hull, there's plenty of time to ponder the enormity of our surroundings that have changed very little in the last million or so years. Massive, sheer cliffs contorted and tortured by incomprehensible tectonic forces have warped solid rock into wavy layers like so much sponge cake. Scattered among these bizarre formations are hundreds of galleries of ancient rock art that, after decades of archaeological study, have dated the oldest murals to at least 50,000 years. 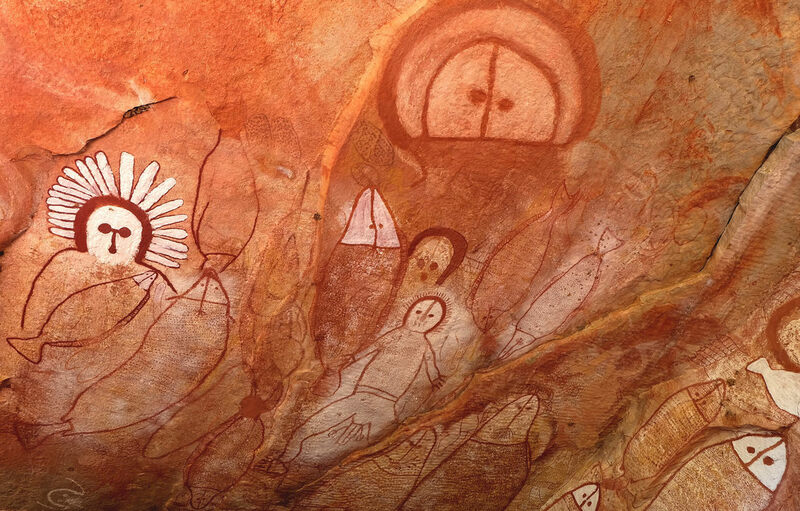 The so-called Bradshaw or Gwion Gwion paintings are starting to look like the oldest known to man and are found widely throughout the Kimberley north of the Prince Regent River. In between our battles with the fierce fish, we swim in the sublime freshwater billabongs, ride the torrid tide through Talbot Bay's Horizontal Falls, ogle the cultured pearls at Cygnet Bay and hike up to the expansive gallery of Wandjina art at Raft Point. Back aboard, chef Ty turns our catch into masterful creations that include such intriguing side dishes as deep-fried Barramundi skin and rock oysters (hand-harvested by ourselves) every which way. Free of interruptions from mobile phones, noisy traffic or glaring street lights, the magnitude of the heavens take on truly cosmic proportions. Massive clouds of stellar gasses and billions of stars against a backdrop of Devonian-era rocks (350 million years) should remind even the most self-obsessed of their utter insignificance in this scenario. 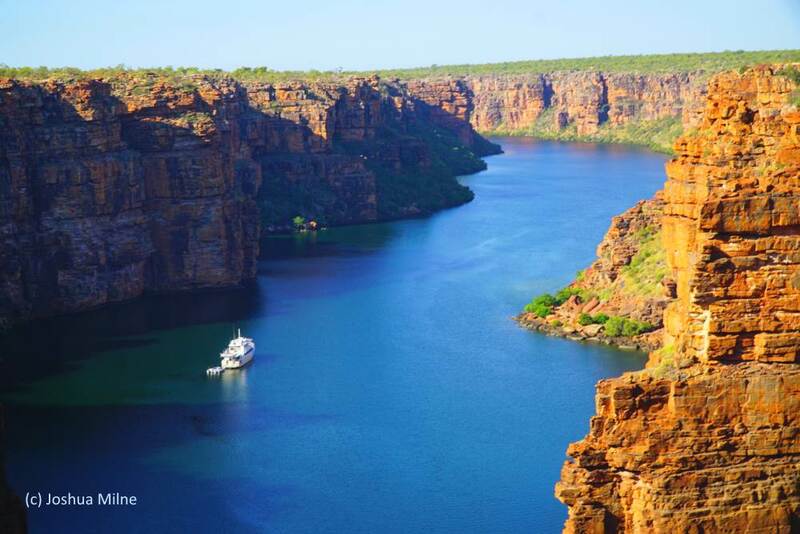 Whether you're a celebrated admiral of industry, a lauded president or a humble farmer, the Kimberley couldn't care less. You are just a temporary speck in the blink of evolution's eye. Let that sink in for a minute. Kimberley Pearl (formerly Dalumba) is no newcomer to these waters either. Her previous lives as a trawler for Kailis and later, a pearling lugger for Paspaley stand her in good stead for the rigours of work in this arduous environment. As gratitude for years of faithful service, her new owners comprehensively outfitted her to a luxurious standard, making her ready for her next phase of life as a high-end, boutique fishing and expedition charter vessel. The two-year, stem-to-stern makeover included an entirely new living and operations section incorporating five super comfortable 2+1 cabins with private facilities, expansive kitchen and dining, relaxation areas and machine space. Just four crew: a master/engineer, a two crew and a chef, handle all duties from navigation to baiting our fish hooks – and everything in between. 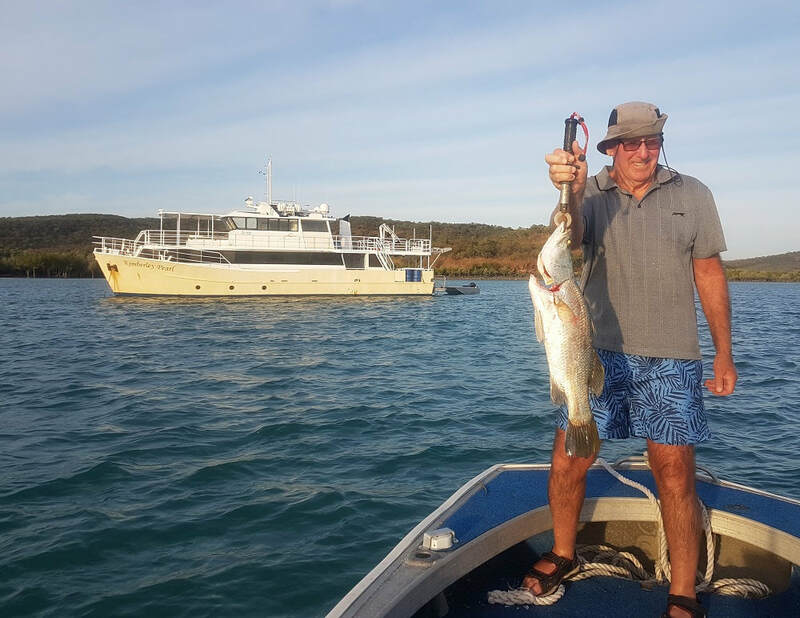 With the clear approval of Betty and her doting entourage, Kimberley Pearl is ready for many more years of stalwart service in the glorious waters of Australia's North West. For further information and bookings, visit www.kimberleypearl.com.au or call Peter on 0408 753 069. 2. 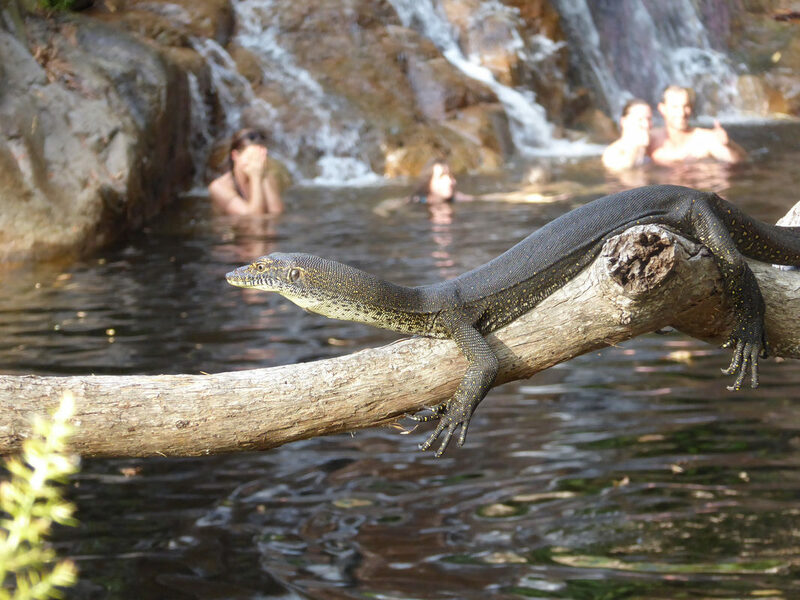 Mertens Water Monitor shares its favourite swimming hole. 4. Climbing up to Ruby Falls for a cool freshwater swim. 5. One that didn’t get away.